I’ve wanted for some time to include other voices in this blog. I wrote here recently about Peter and Caleb Begley and their Father’s Day hike. Peter was a professional photographer and is an enthusiastic hiker and devoted father. It was natural, then, to ask him to share the story of their adventure in both words and image. For Father's Day this year, my son Caleb and I decided to celebrate by undertaking a small adventure in the outdoors together. 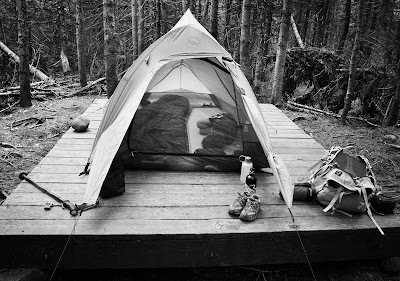 Over three days and two nights we would hope to cover 11.6 miles and 4,137 feet of elevation gain, spending our first night at AMC's Lakes of the Clouds hut, and our second night at the Nauman Tent Site on Mt. Pierce. After spending the night with friends in Jackson, NH, Caleb and I woke up around seven o’clock, nibbled on a light breakfast, and headed for our first destination, AMC's Highland Center in Crawford Notch. When we hike in the area we always stop by to check the weather and say hello to familiar faces. 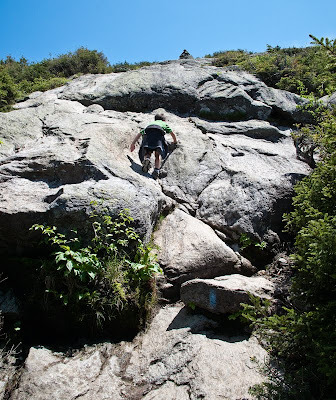 We drove to the Ammonoosuc Ravine trailhead and were feeling the springy earth under our trail runners within a few minutes. 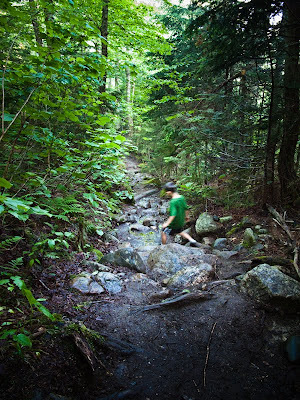 The Ammo Trail, as it is often called, is one of my favorite hikes in the White Mountains. The trail meanders through the forest and along several bubbling waterways, provides an opportunity for a quick break at Gem Pool (a very beautiful pool fed by a waterfall), and thereafter begins to get very fun. After Gem Pool the trail begins to steeply ascend Ammonoosuc Ravine. 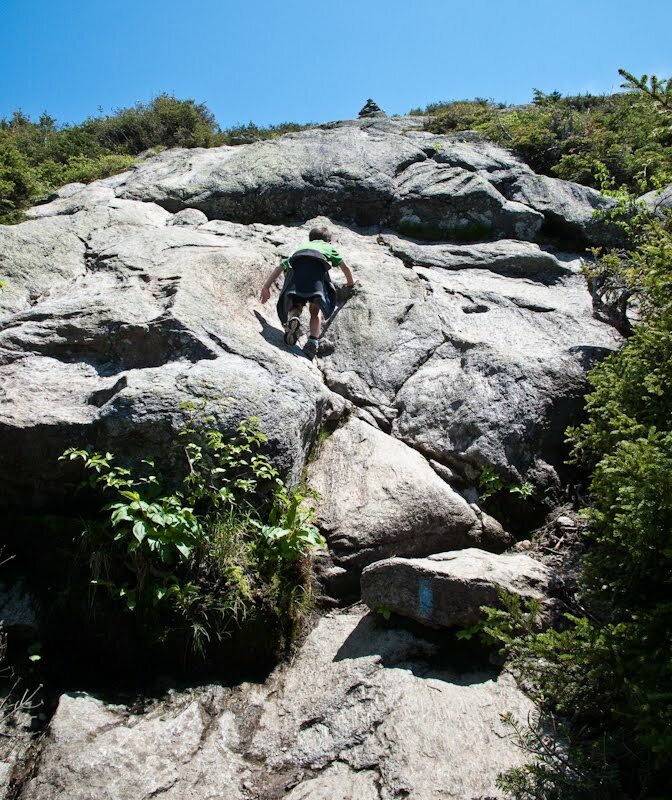 Alternating between stretches of fairly steep rock stairs, large rock slabs, and several more water crossings, the trail is challenging but well worth the effort. The views on the trail and beyond become increasingly breathtaking the higher you ascend, and many sections require a bit of scrambling. All this in three miles! 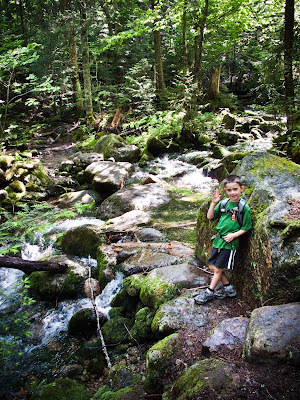 I was naturally very focused on my four-year-old son's safety as well as his physical ability to complete such a hike. Even though I’m confident of Caleb’s physical abilities and he’s already an experienced hiker, even at age four, the weather in the Whites is always a concern, as is exposure above tree line. Water or ice on the upper portion of the Ammo Trail can make this challenging trail extremely dangerous. The weather report looked very favorable, however, and what I saw on the trail and in the sky throughout the day confirmed that we were hiking in ideal conditions. If there is one thing my son loves more than anything else when hiking it is scrambling and rock climbing. We hit the first major slab of the hike shortly after leaving Gem Pool, where we stopped for a snack and more water. Caleb immediately started to use his hands and toes to scramble up the most interesting looking line in the rock. I stayed close at first, but increasingly gave him distance as he showed that he was making solid decisions about where and how to use his hands and feet. The distance I allow him on safer scrambles gives him a huge burst of pride and I think some increased maturity, too. The morning flew by and before we knew it the Lakes of the Clouds hut popped up out of the boulders above us on the trail. Caleb broke into a near run when he saw its roof, and soon we were dropping our packs and refilling our water bottles for a well-deserved rest. After recharging over a tasty bowl of soup, another topping off of our water bottles, and a few hands of cards, we left our packs in the hut and started walking up the trail to Mt. Monroe's summit. Our initial goal was to hike high enough to attain a solid view northwest into Ammonoosuc Ravine where we would watch for my wife and Caleb’s mom, Megan, to arrive. We also wanted a view east to Boott Spur, where some of our friends would be hiking. After a few minutes we were high enough for excellent views in both directions, but the trail became steeper again and Caleb's motivation kicked up a notch or two. Soon we were taking in the spectacular views from Monroe's rocky summit. Caleb laid back on one of the larger boulders, laced his hands behind his head, and gave a very contented sigh. The look of contentment on his face was priceless and would remain with me for the duration of the evening. After a solid breakfast the next morning Caleb and I said goodbye to Megan and our friends and began our 5.2 mile trek southwest to the Nauman Tentsite. I planned to keep a very close eye on the weather, as well as Caleb's energy, as the majority of the hike would be above treeline. Caleb again led the hike and set a healthy but aggressive pace. It felt like only minutes had passed but we soon found ourselves finishing the loop around the east side of Monroe where we could see our entire route for the day before us. I pointed out the route and its peaks to Caleb and we talked over our plans for a few minutes. Eager to get going — I promised him some play time when we arrived at the relative safety of Mt. Pierce's summit — Caleb again set off down the trail. While we hiked down the ridgeline, I alternated between hiking right behind him and leaving large gaps. On our other hikes to that moment, I’d always felt like I was leading Caleb and giving him instructions. As he led us to Mt. Eisenhower that morning, often out ahead of me by as much as 20 yards, I saw him for the first time as a partner. Though I was still very much looking out for his welfare and ready to snap into Dad-mode, it was enlightening to see my young son confidently picking the route around rocks, calling back to me with information about the trail, even setting our break times. After climbing Eisenhower, we closed the distance to Pierce in very short order, and soon Caleb was happily playing with his toy jeep on its gentle summit. The bulk of our hiking for the weekend was now completed and we lazily made our way down to the tent site to set up, have a snack, and hang out for the rest of the afternoon. That evening an incredible show of thunder and lightning descended upon the White Mountains. The thunder was the loudest I can remember ever hearing, and it was incredible to experience the storm from our little tent. I tried several times to wake Caleb up to enjoy the chaos, but my little guy was tuckered and slept soundly through the whole thing. We woke up early the next morning and broke down the tent together. I couldn’t help joking with Caleb about how he slept through the thunder. We were on the trail before six o’clock. Caleb raced down the Crawford Path, despite the slickness that remained from the previous night's rain. In short order, we were enjoying a well-deserved breakfast feast at the Highlands Center. It was pretty neat to see my son growing and establishing his independence on the mountain. I felt that I saw him grow in confidence, courage, and maturity over the three days. 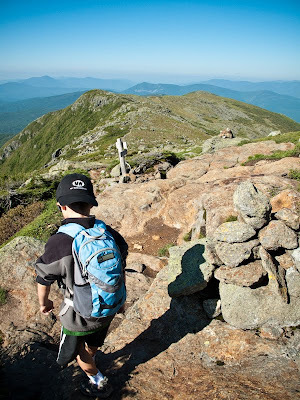 That adventure with my son will certainly be one of many that we share in the mountains. - Caleb waving hello at one of our first water crossings. 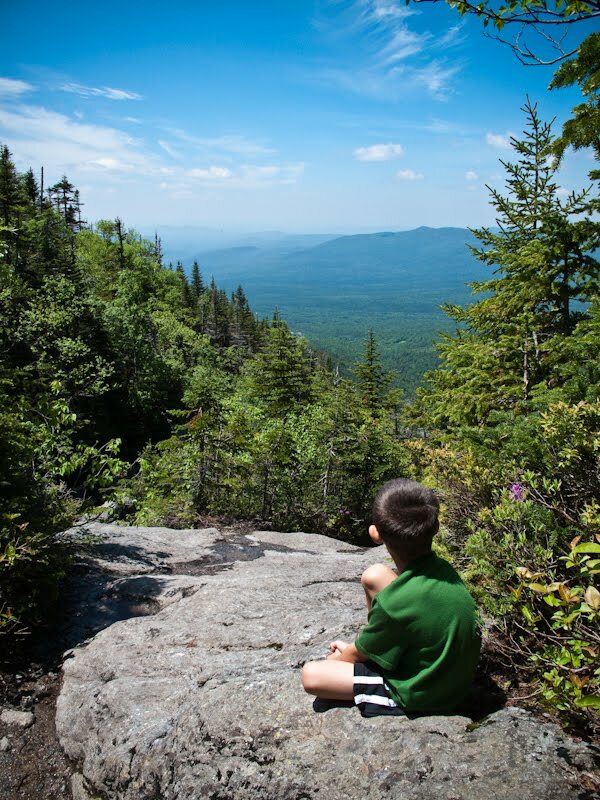 - Caleb takes in the views from the upper portion of the Ammo Trail. - Caleb scrambling confidently on the Ammo Trail. 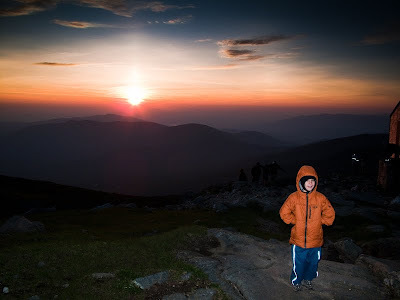 - Caleb enjoying the sunset from Lakes of the Clouds. - The Crawford Path stretches out to the southwest over Mts. Franklin, Eisenhower, Pierce and beyond. - Caleb napping in the tent after a long day of hiking. - Caleb zooming down the Crawford Path during the last morning of hiking.